Our DataPort DP27 removable drive offers powerful and reliable data security for workstations, laptops, desktops, and any other device with USB port (take a look at our DP27 Dock – it's an external hard drive that accepts DP27 drive carriers). Now CRU is bringing our slim data management device to HP ProBook 640 and 650 laptops. With a custom bezel that ensures seamless integration into the laptop's DVD bay, the DP27 makes it easy to quickly eject the drive for transport or security. 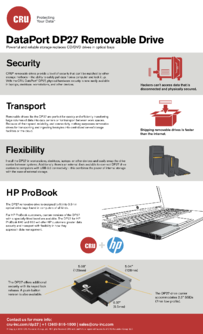 Learn more about the DP27 for HP ProBooks with our new infographic below, and feel free to share! This entry was posted in Desktop Storage, Data Backup, Removeable Drive, Data Security by H.G. Blakeman. Bookmark the permalink.